Pride of the Pack – This Week! This week’s “pride” are two repeaters…. In volleyball, junior Liz Selting was a major factor in the ‘Pack’s pounding of Burwell in 3 sets last week. In the match, Liz had 11 kills, 2 ace serves, 1 solo block and 7 digs. She and her teammates brought the team’s record to 21-4 as they head into Niobrara Conference Tournament play followed immediately by sub-districts. Senior Seth Schumacher added interceptions to his already-double-digit figure of grabs for this season. In addition to the two interceptions as Boyd Co. was readying to score last Thursday night, Seth had 9 tackles, 1 touchdown pass and a touchdown run of 2 yards. The Wolfpack defeated Boyd Co. 38-8. They now enter the playoffs with a 4 pm game on Thursday when they host Axtell. Congratulations to Seth and Liz. 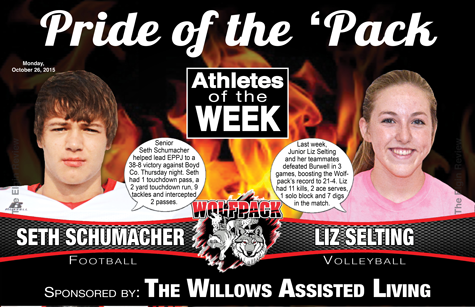 This week’s Elgin Review Pride of the ‘Pack-Athletes of the Week is sponsored by The Willows Assisted Living in Neligh.